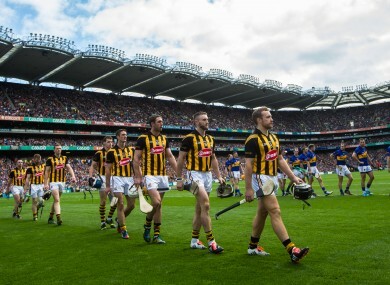 Kilkenny in the parade before last year's All-Ireland final against Tipperary. IT WAS VERY much business as usual for the Kilkenny hurlers when they blitzed Wexford by 24 points in the Leinster senior hurling semi-final. But Galway at Croke Park in next Sunday’s provincial decider should represent a real step-up in class. The Tribesmen have been scoring freely but Kilkenny have key leaders around the field who have faced down the Westerners successfully in recent seasons. King Henry may be gone along with Tommy Walsh, JJ Delaney, Brian Hogan, Aidan Fogarty and David Herity but the Cats machine remains as well-oiled as ever. In an evolving Kilkenny world, Jackie Tyrrell remains a true constant. He first joined the panel in 2003 and has since gone on to win eight All-Ireland senior medals and as many Leinster crowns. Renowned for his bone-crunching tackles, Tyrrell brings a raw edge and real leadership qualities to the Kilkenny defence. He’s played in a number of positions but the versatile James Stephens man, renowned for his love of American Football, found a long-term home at corner back. Murphy is a model of consistency in the Kilkenny full-back line and his emergence in 2011 was a major boost. The sight of Murphy in that green helmet careering out of defence is one of the sights that fans of the Noresiders have become accustomed to since. He was used at full-back during the Allianz League campaign but Joey Holden’s positioning on the edge of the square freed up Murphy for a return to the number 2 shirt. The Danesfort clubman has already collected three All-Ireland senior medals and three Allstar awards in his career to date. A fearless competitor, Murphy adapted to senior intercounty fare with surprising ease, considering he was 22 years of age when he made his championship debut. A real powerhouse for Kilkenny at midfield, Fennelly suffered with injury during 2013 and without him at full tilt, the Cats struggled. He’s still coping with a debilitating back condition but Fennelly was back to his usual self against Wexford in the Leinster semi-final, sitting in front of his half-back line and charging forward at the right times. Totally in sync with his body as a strength and conditioning lecturer at Setanta College, Fennelly has taken the prescribed steps to alleviate his injury worries and continue his career. He has admitted that retirement was an option but even with seven All-Ireland senior medals, the Ballyhale Shamrocks man believes that he’s not done just yet. At 30 years of age, the clock is ticking for Fennelly and he might well decide to call it a day after the 2015 campaign. Hogan is quite simply a hurling gem, the man who picked up the sorceror’s baton even before Henry Shefflin’s retirement. The Danesfort dynamo might be relatively small in terms of height (5ft 7″) but he’s incredibly powerful nonetheless. Verstatile Hogan can operate as an archetypal modern-day midfielder, capable of picking off long-range scores with ease while also piercing holes in opposition defences with well-timed runs. He played closer to goal against Wexford and his early strike helped to knock the stuffing out of the Slaneysiders, paving the way for a massive Kilkenny win. As reigning Hurler of the Year, Hogan has already shown flashes of form that suggest he could claim that individual accolade again later this year. If Hogan is a Hurler of the Year contender, TJ Reid is too. This pair have an uncanny understanding of each other’s play, brilliantly exemplified by that classy ‘one-two’ that paved the way for Reid’s winning score in last year’s Allianz League final against Kilkenny. Looking at Reid’s physique this summer, he seems to have become even bigger and more powerful and that spells trouble for Galway on Sunday. With ball in hand, Reid invariably has goal on his mind and in attack, he’s the man who makes the other Kilkenny forward tick. Reid is often the man making the hard yards for teammates to profit and he’s blessed with a ferocious strike, illustrated by that devastating effort after half-time in last year’s drawn All-Ireland final against Tipperary. Email “The 5 leaders who will take Kilkenny hurlers forward this summer”. Feedback on “The 5 leaders who will take Kilkenny hurlers forward this summer”.